Still not the bottom side view, but much better than that! Awesome set, awesome design, awesome new parts (with a few remarks... to discuss below). 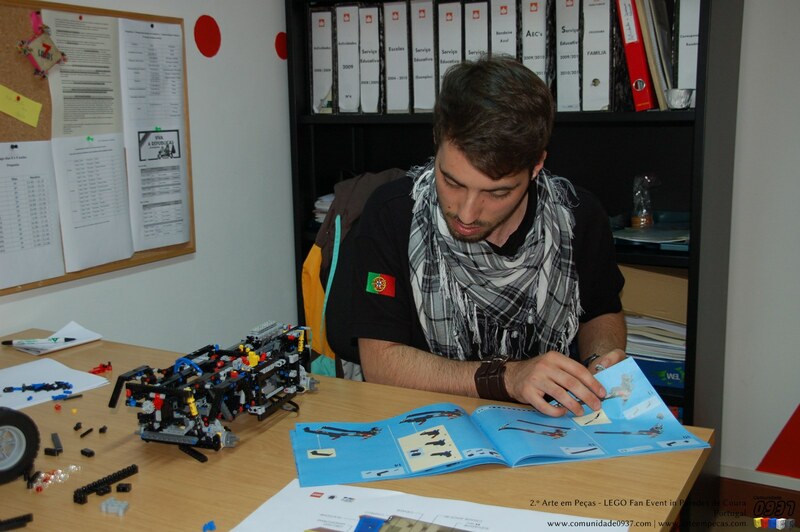 The core of the chassis and Marcos Bessa (LEGO Designer) building the 8110 Unimog. As for the new parts, everything became now clear of course. No 'Axle 11'... a terrible evaluation mistake since the beginning. In the end, it was an 'Axle 9' plus a 'Technic pin long with stop bush'. No C-frame, at least as a standalone part. This one comes attached to a kind of C-frame. It is a petty because a standalone C-frame would be much appreciated. Even if not 100% sturdy, it looks this could have been designed as two separate parts, one (the ball joint) with pin attachments. Unless I became color blind, it looks the small pneumatic pump is now being produced in a new color (LBG). I would advocate that all other pneumatic cylinders were also produced in the same color. There is no such thing like a pneumatic dump bed, unlike one information that previously raised, but in alternative we got a cabin that opens to give access to the underneath motor for maintenance work. WOW! Lots of new parts it looks like! SWEET! This is so cool! I'm so happy with these pictures! It shows us the the guys at TLG did there very best in their design-work! Even with all those new (one-use but oh so very usable/practicable!!! )parts this model is going to be the best set ever. Thanks to the guys at Cumminicade 0937 fot sharing these awesome pictures with us! Is it to much to ask for a little movie so we can see this marvel in action? 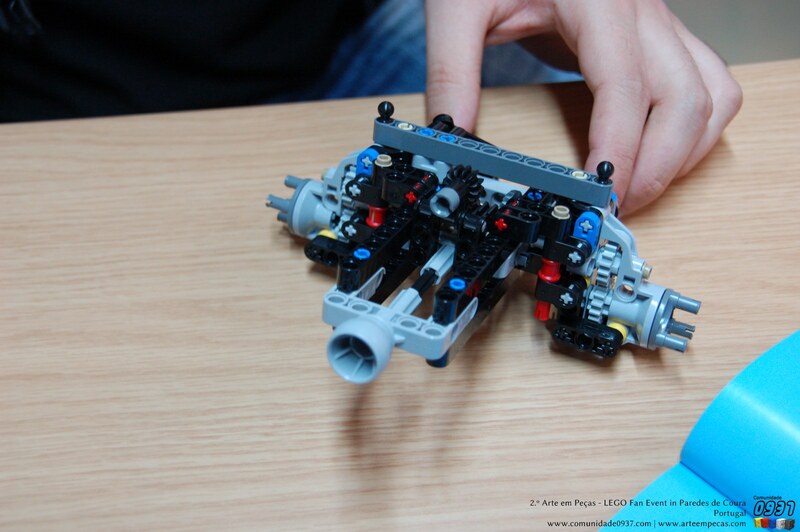 Take a look at the lower left, where you can see four blue "Technic Beam 2 x 0.5 Liftarm" to actuate the pump. This is so awsome. Big THX for this photostream. It's like Christmas has come early this year. What will make the connection between the mid-diff and the piston engine? These pictures have revealed all the left mysteries! how do the wheels turn the diff, as in the new peices for the wheels. it looks like its just a pin no axle. I think an axle is inserted through the gear to connect the hub to the gear. I'm with Menno Gorter, just how does the central diff drive the engine? I wonder if the wrong diff is shown here. Really loving these new photos, not making the wait any easier! I also like how in the back of the instruction manual, it is demonstrated that the crane can be attached to the the front of the vehicle instead. Did anyone else notice the underside of the turntable appears to be in LBG as apposed to DBG? At picture #160 you can see the older type off diff. Remains the mystery of the connection to the wheels and the length of the grey pump cylinder. I still see the new diff at picture #160. Some claim the instructions show the old diff should be there. It can be, but I'm not sure about the BI page photo, referred at EB. Can someone tell me where to pre-order the 8110 lego unimog? or when it will be possible? Wow indeed. This looks awesome. I've not been this excited by a new set in a long time!